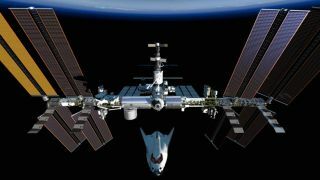 An artist's rendering of Dream Chaser approaching the International Space Station. WASHINGTON — NASA Administrator Charles Bolden said the budget for the agency’s Commercial Crew Program, an effort to send astronauts to the International Space Station aboard privately owned spacecraft by 2017, is safe from sequestration — for now. "So far, we see no significant impact the rest of this fiscal year," Bolden said March 28 during a media conference call about Space Exploration Technologies Corp.'s (SpaceX) recently completed cargo delivery mission to the International Space Station. "But our projection is that if we are not able to get out of this condition, it may slow progress on commercial crew." Bolden had warned in February that the Commercial Crew Program could be among the first NASA efforts to be slowed by sequestration — automatic spending cuts that phased in March 1 and which would eliminate almost $1 trillion in federal spending by 2023. NASA's share of the sequester this year was five percent of its $17.8 billion top line from 2012, plus a smaller cut Congress imposed to shield certain military and civil programs — including some at NASA — from sequestration’s full effect. That left the space agency with $16.65 billion for 2013, under a six-months spending bill signed March 26. It is not yet clear what alternative to sequestration Congress might approve. Dueling 10-year budget plans passed by the House and Senate last month serve as a starting point for negotiations. Meanwhile, the White House is set to weigh in April 10, when it will at last transmit its 2014 budget request to Congress. Budget requests are usually made public in February. Bolden has gone to bat for the White House’s commercial crew request many times, but Congress has never signaled a willingness to fund the administration's signature human spaceflighteffort at that level. His latest plug for a bigger Commercial Crew Program budget was during a March 20 hearing of the House Appropriations commerce, justice, science subcommittee. "If we aren't able to get up to the $800 million level, then I will have to come back and officially notify the Congress that we cannot make 2017 for availability of commercial crew," Bolden said at that hearing. Despite that possibility, NASA is pressing ahead with the next stages of the Commercial Crew Program, which is now in the middle of a $1.1 billion development phase known as Commercial Crew Integrated Capability (CCiCap). In the current phase, which began in August and runs through May 2014, Boeing Space Exploration, Sierra Nevada Space Systems and SpaceX are all working on competing designs for crew transportation systems. NASA will soon begin narrowing the field of commercial crew competitors, Bolden said at the March 20 hearing. The agency plans to issue a request for proposals for follow-on work to CCiCap this summer, Bolden said at the hearing. "We intend to put a request for proposal on the street this summer and you will probably get a downselect," Bolden told lawmakers. However, "you won't see the selection announced until the middle of next year, 2014." The number of companies NASA will bounce from the program “is budget dependent,” Bolden said. The agency would like to fund as many competing designs as it can for as long as possible. In parallel with CCiCap, NASA is working on a separate program to certify that the astronaut transportation systems its commercial crew partners design are safe for round trips to the international space station. The first phase of this so-called Certification Products Contract is under way now, and NASA is planning to solicit bids for the second phase this summer, according to a notice posted online March 19. Boeing, Sierra Nevada and SpaceX got about $10 million each for the first phase of certification work, which must be performed under traditional government contracts. NASA says the Space Act Agreements it uses to fund Commercial Crew development work do not allow the agency to dictate design requirements — something it must do in order to perform a certification. NASA is counting on the Commercial Crew program to provide the United States with an alternative to buying rides for astronauts aboard Russian Soyuz capsules at about $65 million a seat.